Every time I cook something halfway interesting, I try to take a few shots of it, some for use but mostly for practice. My camera is nothing incredibly special but it isn’t bad, albeit totally clunky. It has a sweet flip-screen, though; you can see yourself while you take a self-portrait…Anyway, I find that, much like myself, most of the food I cook isn’t always the most photogenic. So I was excited to get a nice subject from my parents. I think it was a find on one of my mom’s many farmer’s market trips. 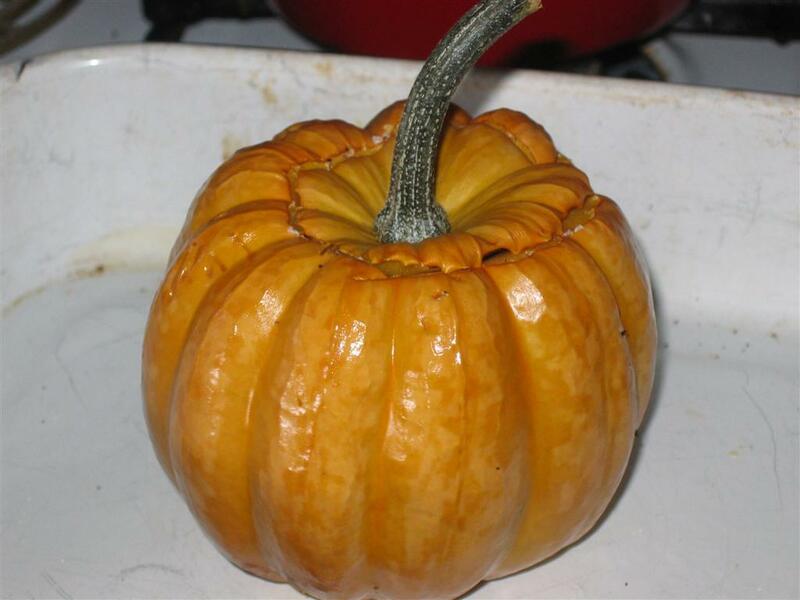 It’s a hybrid of an acorn squash and a pumpkin! I think this was the first shot I took of it, too. I wish I’d had my nice cutting board at the time, it would look lovely! The only problem, though, was how was I going to use it? I wasn’t sure if it was going to be sweet, like a pumpkin, or more savory, like a squash. I decided to try something with it when I made a chicken marsala one day. I searched around for a bit and came up with a recipe for baked miniature pumpkins stuffed with fontina or gruyere (I knew we didn’t have anything like that but I looked them up and…oh wait, gruyere is Swiss cheese, and we ALWAYS have Swiss cheese!) that also included sage, which I had bought fresh for the marsala. Obviously I had to try it. The recipe here is exactly what I made and how I made it, though I have no idea how common the hybrid I used is. I couldn’t find anything about it online. 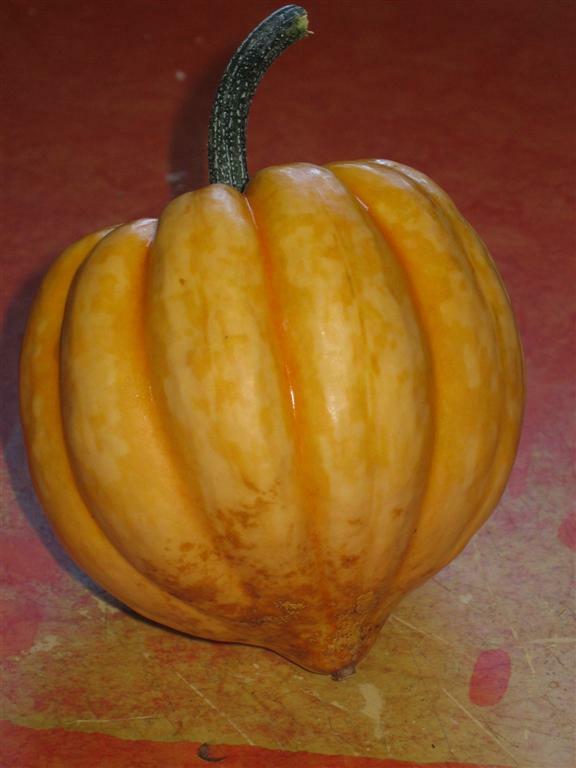 Any sweeter squash will work, but it should be bigger than a mini pumpkin and smaller than an average-sized carving pumpkin. The camera even loves it when it's half eaten! Preheat the oven to 350. Thoroughly wash the pumpkin. Pat dry and cut off the very bottom, making sure not to go all the way through the flesh. Stand on newly-cut end and cut off the top of the pumpkin, slightly more than you would for a jack o’ lantern (enough to get your hand in it). Hang on to the top; you’ll need it. Scoop out the seeds and scrape out any excessive stringiness. Rub the inside of the pumpkin with salt and pepper. Pour in the milk, then add the sage and cheese. 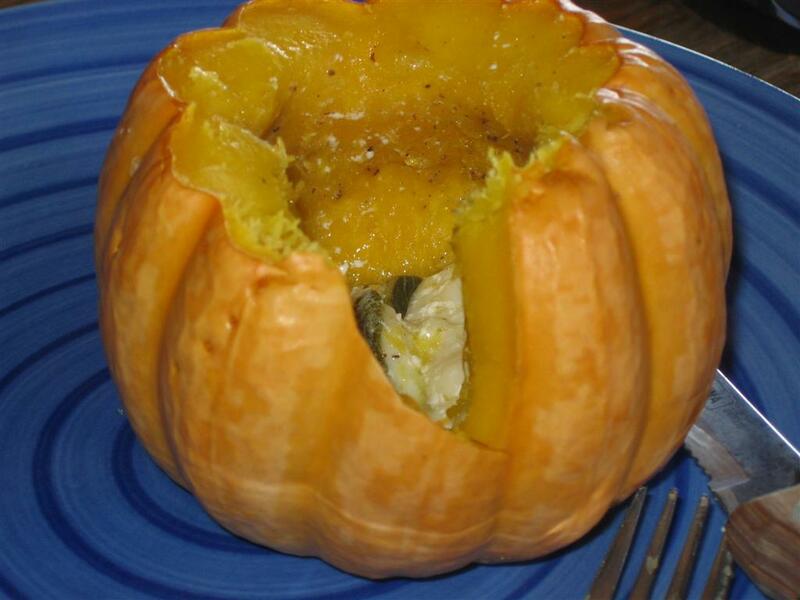 Replace the top and put the pumpkin in a baking pan until the flesh is tender and can easily be poked with a fork. This should take between 35 and 45 minutes. We weren’t able to eat much more than we had when I took the picture above. It waan’t bad at all, but it wasn’t fantastic. It needed more filling, being about twice the size of an actual miniature pumpkin, and was also a little too sweet for this particular filling. Kind of a shame considering it was tasty, but I had no way of knowing where it lay on the sugar scale. I got to play with more fuzzy, yummy-smelling sage, though! It looks like a regular pumpkin with the bottom sawed off. Yum, your stuffed pumpkin sounds totally good. I saw this right after I wrote and entry about stuffed pumpkin :) Great minds must think alike! Thanks! I should have done my research first so I’d know it was going to be so sugary. Where is your blog located?